VW introduced 60 new and updated models in 2013. FRANKFURT (Bloomberg) -- Volkswagen said group global sales rose to more than 9.7 million vehicles in 2013, with the record deliveries fueled by growth in demand for Audi and Porsche models. Surging sales in China, where Volkswagen outsold General Motors Co. for the first time in nine years, more than offset weaker deliveries in the United States at the namesake VW brand, the manufacturer's biggest division by volume, VW said in a statement. VW sales last year, excluding the MAN and Scania heavy truck brands, climbed 4.8 percent to 9.5 million vehicles. Sales by the VW nameplate rose 3.4 percent last year to 5.93 million cars and SUVs. Audi, the world's second-largest maker of luxury vehicles after BMW, increased deliveries 8.3 percent to 1.58 million. Sales at Porsche jumped 15 percent to 162,145 vehicles. Skoda sales fell 2 percent to 920,800 vehicles in 2013 as model changeovers hit volume. Sales at the Spanish brand Seat rose nearly 11 percent to 355,000, helped by the new-generation Leon compact car, as well as a 20 percent sales increase to 76,600 units in Germany and 17 percent growth to 45,700 units in the UK. 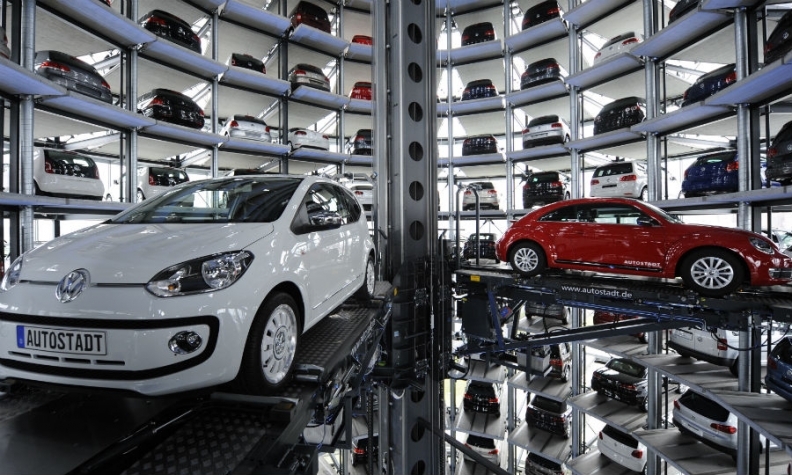 Volume at the Volkswagen Commercial Vehicles unit was flat at 551,900. "As far as the current year is concerned, we expect market developments on a level similar to 2013," Christian Klingler, VW's sales chief, said in the statement. "Even though the situation in Europe would appear to be stabilizing, economic uncertainty will continue and the challenges we will be facing on markets will remain virtually unchanged." VW introduced 60 new and updated models in 2013, including fresh versions of the VW Golf hatchback, and widened dealership networks in markets such as China, Russia and southeast Asia in its bid to become the world's largest automaker by 2018. It recaptured the lead last year among foreign automakers in China, the world's largest car market, with a 16 percent increase to 3.27 million vehicles. The VW car brand has an eventual target to lift operating profit to more than 6 percent of sales from 3.5 percent in 2012, according to a Sept. 9 presentation by Chief Financial Officer Hans Dieter Poetsch that didn't specify deadlines. Seat, which posted an operating loss of 156 million euros in 2012, plans an operating-profit margin exceeding 5 percent. Volkswagen will roll out the Golf Sportsvan in 2014 and introduce a new generation of the mid-sized Passat sedan and station wagon. Porsche will add the Macan compact SUV to its line-up this year and offer an updated version of the 911 Targa sports car. Audi, the division that contributes the most to Volkswagen's group earnings, is bringing a sedan variant of its A3 hatchback to the U.S. and China to attract new customers. VW outlined plans on Nov. 22 for investments totaling 84.2 billion euros ($115 billion) through 2018 to develop vehicles and upgrade factories, including spending on property, plants and equipment. The spending is part of Volkswagen's push to cross the 10 million-vehicle annual sales mark in its effort to overtake Toyota Motor Corp. and GM as the automotive industry's leader. VW has become more cost conscious since early September, when it laid out earnings goals in that include making Seat profitable. It said later that month that "further belt-tightening" is needed. Since CEO Winterkorn took the helm in 2007, Volkswagen has acquired the Porsche sports car brand as well as truckmakers Scania and MAN and Italian motorcycle producer Ducati. It has also more than doubled the number of factories around the world to 105. In addition to expanding outside Europe to sidestep the regional auto-markets drop to a two-decade low, Volkswagen has also invested in technology to share parts as a means to lower production costs. The company reiterated a forecast in October that operating profit in 2013 would match the 11.5 billion euros posted in 2012 as spending on new technology and additional production capacity offset delivery gains, with earnings predicted to resume growth in 2014. Volkswagen is scheduled to release financial figures for 2013 on March 13.